Four years ago, almost to the day, I wrote a blog, "Rooting for Ahmadinejad," which explained why I wanted the worst of the candidates on Iran's election day in 2009 to win the election. 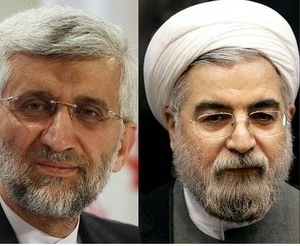 Presidential candidates in Iran, Saeed Jalili (left) and Hassan Rouhani. whoever is elected president, whether Mahmoud Ahmadinejad or his main opponent, Mir Hossein Mousavi, will have limited impact on the issue that most concerns the outside world – Iran's drive to build nuclear weapons, which Khamene'i will presumably continue apace, as he has in prior decades. June 15, 2013 update: To universal surprise, especially given the fraudulence of the 2009 election, Supreme Leader Ali Khamene'i permitted the closest thing to a moderate, Hassan Rouhani, not only to lead the vote but to get over 50 percent of it and so win the presidency outright, in one shot. Presumably, Khamene'i had his reasons, domestic and foreign for allowing this to happen: perhaps he wanted better economic performance and less contention as his government built nuclear weapons. I am pleased for Iranians but distressed for the outside world. Rouhani might have a positive impact on such domestic matters as economics, the status of women, and artistic freedom. But he will have little to no say over his government's foreign policy, such as its support for terrorism, its all-out backing of the Assad regime, and the nuclear buildup. Already, U.S. Secretary of State John F. Kerry has praised the "courage" of Iranians who "expressed their desire for a new and better future." He went on: "We, along with our international partners, remain ready to engage directly with the Iranian government. We hope they will honor their international obligations to the rest of the world in order to reach a diplomatic solution that will fully address the international community's concerns about Iran's nuclear program." (1) This begins the reprieve for Tehran that I worried about yesterday and that will likely mean a deterioration in an already-weak Western policy toward the Islamic Republic of Iran. (2) For similar analyses, see those of Avi Issacharoff and Barry Rubin.